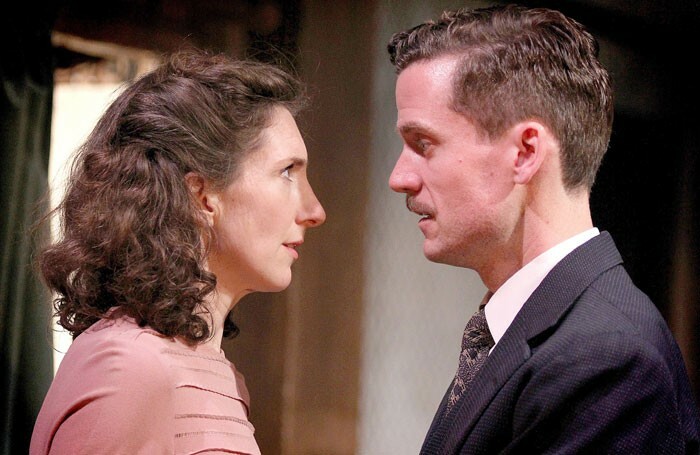 The uncompromising philosophy of Terence Rattigan and his no-nonsense views on the complexities of heterosexual relationships are sensitively staged in this sympathetic production at the Watermill. The production team has taken some liberties to bring a darker quality to the plot, although whether this is for dramatic impact or for commercial purposes to appeal to a modern-day audience is not altogether clear. It works on either level. Emotive music interjects at relevant moments with blue lighting penetrating up from the skirting boards. While this bold statement is a more obvious embodiment of Hester Collyer’s figurative drowning, the set designed by James Turner subtly incorporates The Deep Blue Sea of the title within its walls so that Hester is constantly fighting her metaphorical battle. Hattie Ladbury authentically creates the role of Hester Collyer, balancing the character’s anxieties with a strength of resolve. Adam Jackson-Smith is excellently cast as her lover Freddie Page, with Adam Kotz as the betrayed Justice William Collyer and Eliza Hunt as the entertaining Mrs Elton. James Hillier is the enigmatic Mr Miller, with Adam Best as Page’s chum Jackie Jackson and Fred Lancaster and Bathsheba Piepe as the naive young couple Philip and Ann Welch.